Fr. 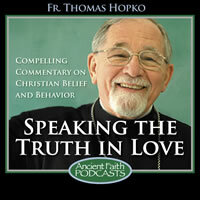 Thomas Hopko dedicated three episodes of his Speaking the Truth in Love podcast to the discussions about dialogs between the Orthodox and Roman Catholics. As promised in his last episode, Fr. Thomas shares with us the paper he wrote in 2005 outlining what the Roman Catholic Church would need to do to unite with the Orthodox. He broke it up into two parts and this is part one.